(SANA news) Thousands of citizens escorted the funeral procession until the village of Hamdan where the bodies of those killed in the aggression were buried. The citizens and mourners stressed that this US aggression which claimed the lives of civilians reflected the logic of destruction and aggression pursued by the US against civilians irrespective of any moral or legal deterrent. The funeral procession was attended by official and public circles in Deir el-Zour Governorate. Syria is closing the American school and cultural center. …..I have two sons at the school and heard this also from a board member. I don’t suppose those gung-ho CIA types thought about what this would mean when they swung in on their helicopters. If the closure is permanent, it will be devastating not just for my family, not just for Americans, but for the whole international community here in Syria. There are dozens of children at this school with parents at international companies such as Shell, working for the UN and also many children from well-off Syrian families. The school has had some difficult times recently — last year the government delayed the issue of 34 visas so the school started late. This year, the education ministry imposed a Syrian studies element in the curriculum and made it compulsory for all students to take Arabic. But the school was doing its best to cope. No way can they do anything in the face of such a foreign policy disaster…. U.S. military helicopters launched an extremely rare attack Sunday on Syrian territory close to the border with Iraq, killing eight people in a strike the government in Damascus condemned as “serious aggression.”…. The military’s argument is that “you can only claim sovereignty if you enforce it,” said Anthony Cordesman, a military analyst at the Center for Strategic and International Studies. “When you are dealing with states that do not maintain their sovereignty and become a de facto sanctuary, the only way you have to deal with them is this kind of operation,” he said. …. U.S. officials have long complained that the Syrian government has allowed Arab fighters to pass through the country to enter Iraq, but since last year, top military leaders have praised Syrian efforts to curb the flow. In recent months, officials have estimated that as few as 20 fighters a month have been crossing into Iraq, down from more than a hundred a month in 2006. But officials said the raid Sunday, apparently the first acknowledged instance of U.S. ground forces operating in Syria, was intended to send a warning to the Syrian government. “You have to clean up the global threat that is in your back yard, and if you won’t do that, we are left with no choice but to take these matters into our hands,” said a senior U.S. official, who spoke on the condition of anonymity because of the sensitivity of the cross-border strike. The United States has offered similar justifications for recent cross-border strikes in Pakistan, where it has launched missile attacks and at least one air assault against suspected members of Afghanistan’s Taliban insurgency. “As targets present themselves, and are identified . . . they become more and more at risk. Just like in Pakistan, there will be steps taken to deal with it,” the senior official said. Syrian Foreign Minister Walid al-Moualem called the operation Sunday a “criminal and terrorist aggression” that killed seven civilians. Speaking to reporters in London, he said Bush administration officials were following “the policy of cowboys” and noted that the United States has been unable to seal its own border with Mexico. The office of French President Nicolas Sarkozy issued a statement expressing “serious concerns” about the raid and the loss of Syrian lives. Syria has lately embarked on policies that France and other Western governments have viewed favorably, including indirect peace talks with Israel. Russia also voiced concern about the operation. In the raid, four helicopters carrying U.S. troops flew into an isolated area of scattered residences and buildings in search of an Iraqi insurgent whom the U.S. Treasury designated in February as a key facilitator of the transfer of weapons, money and fighters into Iraq. Treasury officials gave his full name as Badran Turki Hishan al-Mazidih and his nickname as Abu Ghadiyah, and said that the founder of the insurgent group al-Qaeda in Iraq, Abu Musab al-Zarqawi, had named him the organization’s commander for Syrian logistics in 2004. On the ground, U.S. troops disembarked and opened fire to kill “several armed males who posed a threat to U.S. forces,” according to the senior official. The official declined to say whether Mazidih was killed or injured in the fighting. Other unnamed U.S. officials were quoted in news media accounts Monday as saying he had been killed. Moualem said U.S. troops landed at a farm where they killed a father and his three children, the farm’s guard and his wife, and a fisherman. The network run by Mazidih has smuggled hundreds of foreign fighters into Iraq, including many who became suicide bombers, officials and analysts said. “He ran one of the largest and most productive foreign fighter networks out of Syria” and was “directly responsible for hundreds of foreign fighters who killed thousands” of Iraqis, the senior official said. July report made public their latest findings. The documents indicated that at least 95 Syrian “coordinators” were involved in moving the foreign fighters. Many of the coordinators were from smuggling families in Bedouin clans and other Syrian tribes. A number of them appeared to be cooperating with al-Qaeda in Iraq for pay rather than out of ideological sympathy. Many recruits reported to their handlers in Iraq that they had passed through Damascus, Syria’s capital, and then an area near the Iraqi border called Abu Kamal. Sunday’s raid occurred in Abu Kamal. …. It is certain that the attack, for which full details are yet to be known, will lead to plenty of bad blood between Damascus and Washington. Syrians already feel that the US is ungrateful for a range of accomplishments in which Syria has assisted, such as harboring 1.5 million Iraqi refugees, tightening control of the border, hammering out the Doha Agreement, ending the presidential dilemma in Lebanon, and helping moderate the behavior of Iran. Although the US is upset that Syria has managed to shake off US-imposed isolation, Washington does realize that Syria’s cooperation is needed to get things done in the Middle East. In December 1990, former US secretary of state James Baker described Syria as “a major Arab country who happens to share the same goals as we do”. The huge difference in US policy on Syria over the past 15 years shows how difficult it is to mend a very fractured, and perhaps irreparable, relationship. This is especially true after the events of October 27 and will remain so as long as Bush is in the White House, or if he is replaced by Senator John McCain. When the Gulf War started in 1991, Syria was on America’s blacklist because of a failed attempt to blow up an Israeli airplane at Heathrow Airport in London in 1986. In light of the Gulf War, however, Bush realized that as much as he would have loved to punish Syria for its anti-Israel behavior, he needed Syria to prevent the occurrence of similar attacks. The late president Hafez al-Assad, eager to comply, met with Baker for the first time on September 14, 1990, signaling the start of a 10-year honeymoon between Damascus and Washington. Then, on November 23, Assad met with Bush, who requested Syrian support in Operation Desert Storm, and promised to hold an Arab-Israeli peace conference once Kuwait was liberated. …. … After Sunday, Syria is no longer satisfied. History proves that when the Syrians become angry, they can do much in the Middle East. Nazem al-Qudsi was right in 1945: America is Syria’s potential best friend. But this potential friendship will only work with a wise man like Roosevelt, not someone who invades air space and kills civilians, like George W Bush. The raid was the latest sign that the U.S. is now willing to mount attacks in sovereign nations in pursuit of insurgent groups operating in Iraq and Afghanistan, as well as those who support them. Last month, U.S. special operations forces carried out a similar raid in the tribal border region of Pakistan, drawing loud criticism from the Pakistani public and senior government officials in Islamabad, the capital. Abu Ghadiyah, an Iraqi native believed to be in his late 20s, has for several years been a key figure in the flow of foreign fighters and weapons into Iraq, American officials said. “He comes from a family of smugglers,” said the senior U.S. official. “He seems to have turned the family business toward the movement of terrorists, explosives, weapons, etc., into Iraq.”…. “He’s the classic example of a terrorist facilitator and financier,” said Matthew Levitt, who from 2005 to early 2007 helped oversee a U.S. government crackdown on Abu Ghadiyah’s financial network while deputy assistant secretary for intelligence and analysis at the Treasury Department. However, Abu Ghadiyah’s death is unlikely to decimate the network because of its strong funding streams and because other members, including a brother, have been active, said Levitt, now with the Institute for Near East Policy, a Washington-based think tank…. U.S. officials said Abu Ghadiyah, a nickname for Badran Turki Hishan Mazidih, was appointed by former Al Qaeda in Iraq leader Abu Musab Zarqawi to be the group’s Syrian commander for logistics in 2004. After Zarqawi’s death in 2006, Abu Ghadiyah began working for the new leader of Al Qaeda in Iraq, Abu Ayyub Masri, according to U.S. officials. Abu Ghadiyah provided and arranged false passports, weapons, guides, safe houses and allowances to foreign terrorists preparing to enter Iraq, Treasury officials said…. The timing was startling, not least because American officials praised Syria in recent months for its efforts to halt traffic across the border. But in justifying the attack, American officials said the Bush administration was determined to operate under an expansive definition of self-defense that provided a rationale for strikes on militant targets in sovereign nations without those countries’ consent….. Since the Sept. 11 attacks, the United States has attacked terrorism suspects in the ungoverned spaces of countries like Yemen and Somalia. But administration officials said Monday that the strikes in Pakistan and Syria were carried out on the basis of a legal argument that has been refined in recent months to justify strikes by troops and by rockets on militants in countries with which the United States is not at war. The justification is different from the concept of pre-emption the administration articulated immediately after the Sept. 11 attacks, and which was used as the rationale for the invasion of Iraq. While pre-emption was used to justify attacks against governments and their armies, the self-defense argument would justify attacks on insurgents operating on foreign soil that threatened the forces, allies or interests of the United States. Administration officials pointed Monday to a passage in President Bush’s speech to the United Nations General Assembly last month as the clearest articulation of this position to date. In seeking to carry out cross-border missions inside Pakistan and now in Syria, the United States government is expected to make the case that these operations will help protect the lives of American troops. It is not clear how far-reaching the White House may be in seeking to apply the rationale, but several senior American officials expressed hope that it would be embraced by the next president as well…. But one military officer said Monday that while Syria had been able to take specific steps like detaining combat-age men found flying into Damascus airport on one-way tickets, there had been less success in halting the flow of money and weapons to the insurgency. The Iraqi government found itself in an awkward position on Monday as it sought at once to remain on friendly terms with Syria, which is a neighbor and now home to more than a million Iraqi refugees, but also to bolster the United States in going after people believed to be fomenting antigovernment unrest in Iraq. “This area was a staging ground for activities by terrorist organizations hostile to Iraq,” said Ali al-Dabbagh, the Iraqi government spokesman. He said Iraq had previously requested that Syrian authorities hand over insurgents who used Syria as their base. “We will do what is necessary to protect our troops,” Defense Secretary Robert M. Gates said in Senate testimony last month, when asked about the cross-border operations…. The US incursion says a lot about American weakness, too. In Iraq, withdrawal looms. Securing the “surge” gains, handing off to the Iraqi security forces, and signing an end-of-year status of forces agreement (Sofa) are imperative military aims. But they are also political needs that opponents, such as Baghdad’s Shia politicians and al-Qaida in Iraq, are trying to exploit. …. Even though Iraqi government spokesmen justified the US action, politicians warned it could further complicate the Sofa negotiation. The raid has again highlighted the limitations of Iraq’s sovereignty and the instability of its frontiers with Syria, Turkey and Iran. It also demonstrated Washington’s readiness to disregard border security agreements between Iraq and its neighbours that it was instrumental in creating. Just as Russia’s Vladimir Putin accused the Bush administration of engineering the Georgia crisis to help John McCain’s presidential bid, yesterday’s surprise is certain to be cast in a similar light by some in the US. It may also be seen as a sort of “goodbye” present from the neocons. Conversely, Bush’s growing propensity for sending special forces after the “bad guys” wherever they are thought to be, and damn the consequences, may help convince American voters that Obama is the safer, saner bet. قال وزير الخارجية وليد المعلم إن الغارة الأمريكية على سورية كانت تهدف إلى طمأنة أعداء دمشق أن واشنطن لا تحذو حذو فرنسا وبريطانيا في التقارب مع سورية. JERUSALEM, Oct. 27 — Israel moved closer Monday to a bruising election campaign that will decide the future of peace talks, as polls showed the centrist foreign minister, Tzipi Livni, in a surprisingly close race with hard-line opposition leader Binyamin Netanyahu. What “Middle East Democracy” are you talking about? Now that the true nature of the target has been disclosed, it is clear the undertaking was purely military in motive. Abu Ghadiya, an Iraqi citizen (not Syrian), was regarded as the most prominent smuggler of foreign operatives crossing the Syrian border. This policy asserts all nations have an obligation not to harbor or tolerate terrorists, criminals and accomplices who are committing violence and organized crime in neighboring countries. The adoption of this policy has relevance to this incident (it was in fact a broad warning) and has wider implications elsewhere, such as on the continent of Africa. You mentioned that “now that the true nature of the target has been disclosed..” Exactly who disclosed the nature of this attack? If it is the same source who told us about Iraq’s WMDs, you will need to rethink your reasoning. Bush’s policy-making process has been nicely wrapped with lies, recklessness, and above all sheer ineptness. Friend in America – so you would have no problem with the Cubans liquidating Luis Posada Carriles on the streets of Miami along with sundry other Cuban-American terrorists? It’s quite unlikely they were unarmed. Even if they were innocent civilians who had nothing to do with foreign fighter smuggling, most people in this part of the mid-east are armed simply because they need to protect themselves. When US forces (actually, pretty much any military force) conducts this kind of operation, people with guns are considered threats and are killed because they are outwardly indistinguishable from the smugglers/criminals/terrorists/whatever. DAMASCUS, Syria (AP) — The Syrian government has ordered that an American school and a U.S. cultural center in Damascus be closed in response to a deadly raid by U.S. helicopters near the Syrian border with Iraq. The official SANA news agency says the decision came at a Cabinet meeting Tuesday chaired by Prime Minister Naji Otari. The report says the Syrian education minister was given instructed to implement the decision. Syria claims U.S. troops in four helicopters attacked a building near the border with Iraq and killed eight people on Sunday. U.S. officials said the raid killed a top operative of al-Qaida in Iraq who intelligence suggested was about to conduct an attack in Iraq. I have two sons at the school and heard this also from a board member. I don’t suppose those gung-ho CIA types thought about what it would mean when they swung in on their helicopters. The school has had some difficult times recently — last year the government delayed the issue of 34 visas so the school started late. This year, the education ministry imposed a Syrian studies element in the curriculum and made it compulsory for all students to take Arabic. But the school was doing its best to cope. No way can they do anything in the face of such a foreign policy disaster. Syria should lower it’s voice so it will not affect the American election , Obama will be so grateful if he wins , he wll make Syria his best friend , and he should, for the sake of US interest in the Mideast. You raise an interesting question because it says ‘what is good for the goose is good for the gander.’ You are right in that respect. Probably a case by case study will evolve. In the case of Carriles and others Cuban expats there has been active subvert action by them (he and others may have transferred money but there is no active resistance in Cuba); over the past 40 years there have been several arrests for carrying or shipping arms, and a perhaps a few failures to detect other subvert actions, but all have been incidental. That answers your question pragmatically, but for policy discussion specific instances only are tests of the policy. Under the announced policy do you think Cuba can liquidate an expat in the U.S. with impunity? What degree of provocation should be necessary? Should there be limitations? If so, what do you suggest? There is only one source. Instead of belittling the disclosure, we can wait for disclosures from other sources, if any. Even better is a discussion of the implications of the policy announced at the United Nations. Blowback artfully stated that policy is a 2 way street. I agree. It does have implications for America and there will be debates among scholars on how it creates limitations on U.S. power. I believe it will become apparent to many that this policy actually benefits Syria and its over riding concern for national security. The raid makes no sense at all unless US commanders are Israeli dual nationals and consider Syria to be the eastern West Bank. Please allow me to remind you of the big picture. American policies towards Iraq, starting with sanctions in the 90’s until today resulted in millions dead, injured, homeless, jobless, hungry … and, I would imagine, VERY angry at the United states. Through this week’s unnecessary killings in Syria, the failed Bush administration managed to unite Syrians of all types in developing negative feelings towards the United States. A number of opinion polls in Europe showed that the United States (and Israel) are ahead of Iran in terms of being perceived as the greatest threat to world peace. Is this the way you want the rest of the world to see the United States? My friend, you need a Jimmy Carter to undo the damage… or you need four more years of McCain & Palin madness to convince you that you need a Jimmy Carter. That’ll be interesting. Let the magic show begin! US commanders are Israeli dual nationals and consider Syria to be the eastern West Bank. Another conspiracy theory for my overflowing shoe box. Thanks! I hope you are impressed with your Sarah Palin who told the Israeli Ambassador that she looks forward to working with his “Jewish Agency”! Good Choice Akbar. Keep voting republican, even if they nominate a monkey in 2012. Reporting from the election center. This morning the early voting line was 200 feet long and getting longer by the minute; it is completely different election from all previous ones, it is going to change a lot in American and in the world. Obama does not need the Syrian regime to lower his voice to help him win this election; he does not need the support of authoritarian regimes. I think Obama will be more effective to deal with these regimes than the current administration because he knows the power of the people and he expected to project the American power in a new way. What Bush espoused at the UN was not a policy; it was yet another doctrine based on his faulty fundamental principles of moral superiority. Even if we would to academically argue that it was a genuine doctrine, a resulting policy would certainly not involve appointing the US as an enforcer. Nations having an “obligation to govern responsibly” and an “obligation to prevent our territory from being used as a sanctuary…” can hardly be translated into a trigger-happy policy where nations that the “right” to do what other nations have failed to do internally. Several facts need to be underscored here. The moral unilateralism that underlines the Bush doctrines (and there are many of them – mostly reckless and ill-conceived) has proven to be ineffective and hapless around the US and the world. Furthermore, almost all of Bush policies that emerged from his doctrines have been implemented by incompetent administration thus undermining any good that they might have encompassed. But irrespective of whether this was a doctrine or a policy, it is in fact irrelevant at a time when the US is correcting its course and transforming its policy-making bodies back to their roots of liberty and respect of the law. January 20th just can’t come soon enough! We need another Carter? I don’t remember him being particularly popular in the ME, but perhaps my memory is faulty. As for Iraqi’s, most that I’ve talked to seem to understand that it was Saddam that starved them in the 1990’s, not the US/UN, considering most of those actually doing the starving were purposely confined to certain demographic groups by the regime. Well, let me assure you, most people on the other side of the border are armed. Most of the bedoin who travel through the area have some guns for self-defense from the criminal element. Given the amount of smuggling that transits through this area (both in terms of foreign fighters and the more mundane) one would think firearms would be relatively common on the Syrian side as well, but I’ll defer to your direct experience on the subject. I understand your criticism my friend. But I submit it would be a great error to blindly dismiss everything that comes from Washington. Everyone, I mean everyone, can cite past grievances about another country. When it comes to formulating policy, those who look to the past are not formulating new policy; they are just trying to repeat the past. Bush’s statement is a new take on a chronic problem. So if we shed the anti-Bushisms and the anti-Washington remarks and look at the policy declaration for its own value, we can have a very useful international discussion. Right here. The big picture for the middle east, and elsewhere in the world, is what new foreign policy or policies will foster peace and friendship for the future and what ones will not. Intellectual ideas have their own life and are not limited to the country of origin. The policy announced at the United Nations last month has far reaching implications. It is looking at the broad view of a possible future. Does it offer a potential that past conduct (and policies) have not? I think so. For further development it needs scholarly discussion. What could be better than the scholars in Syria taking the lead? A footnote: this policy statement did not come from Chaney or the so called neo-coms. It probably is best to try to put ourselves in the scene. Those guys were working on a building [every single report has agreed on that],they were carrying arms? And then they see American Special Forces land from helicopters from across that border that has contained the war completely for the Syrians, so they are not regular victims of aggression. What is the likelihood that they would threaten the Americans by pulling their own guns? That, in my estimation, would be the absolute last thing a Syrian man would do at a moment like that. They were just shot in cold blood before they got over rubbing their eyes to see if what they were seeing was true, that is all. Maybe President Carter WAS NOT popular throughout the Arab world, but today he is very popular, and respected. Does this clip seem to be authentic? Current policy makers in Washington have demonstrated their failure to account or take responsibility for the worst global financial crisis to hit the world in 80 years even though the Nobel price for economics have been given to US citizens for the past many years. This performance doesn’t get better when it comes to foreign policy, much less about foreign policy with regards to the Middle East. Americans are ready for a new White House with a new set of policy makers who can level with the American people and exercise truely responsible local and international leadership. Bush’s Way of Waving Goodbye to Syria? The US says its cross-border raid into Syria killed a top terrorist. Still, international reaction has been intense and critical. While the German government has kept silent, media commentators haven’t been shy about lambasting the US. Syrians carry the coffin of one of the victims of Sunday’s US raid inside Syrian territory. Following its surprise cross-border raid into Syria on Sunday, the United States has responded to a chorus of global consternation by revealing that the target of the attack had been a senior member of al-Qaida in charge of smuggling insurgents into Iraq. Still, criticism of the unilateral attack has been intense. In Paris, the office of French President Nicolas Sarkozy released a statement Monday expressing “serious concern” and calling for “the strict respect of the territorial integrity of states.” Javiar Solana, the EU’s top foreign policy official, said that he was “worried” and hoped matters would quickly return to normal. The foreign ministries of China and Russia both joined the chorus, focusing their criticism on US violation of Syrian territory. A senior US counterterror official told the Associated Press on Monday that the mission had targeted and killed Abu Ghadiyah, also known as Badran Turki Hishan al-Mazidih, a member of al-Qaida who coordinated the smuggling of insurgents via Syria into Iraq. According to the official, the decision to launch the attack came after US intelligence sources received reports that Abu Ghadiyah was planning to launch an imminent attack in Iraq. Similar reports from last spring — which were not acted upon — preceded an attack in Iraq directly across the border from the site of Sunday’s assault. The spring incident, which resulted in the deaths of 11 Iraqi policemen, is believed to have been personally led by Abu Ghadiyah. In Germany, responses to the attack have been fairly muted. Neither Chancellor Angela Merkel nor Foreign Minister Frank-Walter Steinmeier have released statements on the incident. Some German commentators take a look on Tuesday. more in Politics & Campaign »WASHINGTON — Damascus largely froze high-level diplomatic efforts with the U.S. after an American strike inside the country, a move that threatens support for broader peace initiatives in the Middle East. Syrian officials on Monday sent a demarche to the American Embassy in Damascus in response to what it claimed was a U.S. cross-border helicopter attack inside eastern Syria on Sunday that killed eight people. On Tuesday, officials ordered an American school and a U.S. cultural center in Damascus closed, the Associated Press reported. President Bashar Assad’s government said it was largely freezing high-level diplomatic engagement with the Bush administration for its remaining three months in office. Syrian diplomats said that before the raid they had been considering inviting to Damascus the State Department’s point man on the Middle East, Assistant Secretary of State David Welch, for talks aimed on furthering Israeli-Syrian peace negotiations, as well as efforts to stabilize Lebanon and Iraq. Pentagon and White House officials declined to comment on Syria’s charges. Bush administration officials have regularly charged Syria with failing to stop the flow of foreign and al Qaeda fighters into Iraq. The Associated Press reported the raid killed the al Qaeda-linked head of a Syrian network that smuggled fighters, weapons and cash into Iraq. The operation targeted the home of Abu Ghadiyah; the Treasury Department has named him as one of four major figures in al Qaeda’s Iraq wing who were living in Syria. Relations between the U.S. and Syria had shown signs of improving in recent weeks. Late last month, Secretary of State Condoleezza Rice and Mr. Welch held rare face-to-face meetings with Syrian Foreign Minister Walid Moallem in New York. Both sides said they hoped to follow up the meetings by developing a more regular dialogue focused on Middle East security issues. Ms. Rice particularly praised Damascus’s pursuit of peace talks with Israel and its decision to open formal diplomatic relations with Lebanon. Mr. Moallem said he sought greater cooperation with the U.S. in confronting al Qaeda and other extremist groups in the region. The Bush administration froze most high-level engagement with Syria following the 2005 murder of former Lebanese Prime Minister Rafik Hariri. A United Nations probe has implicated Syrian intelligence officials in the assassination. Democratic presidential candidate Barack Obama has said that if elected he would seek to directly engage Syria in a bid to win its support for stabilization efforts in the Middle East. The Republican Party’s candidate, John McCain, also has been supportive of the Israel-Syria peace track. Still, Sunday’s attack appears to be a signal that the Pentagon is taking an increasingly aggressive stance against countries that appear to be aiding militant groups, whether it’s Syria or Pakistan. This doesn’t mean, however, that this rules out diplomacy occurring at the same time. The American cross-border attack has also sent jitters to Iraq’s other neighbors, namely Iran. Syria and Iran have been opposing Iraq signing the Security of the Forces Agreement with the U.S., and have expressed anxiety that the U.S. could use its military bases in Iraq to stage cross-border attacks on their soil. As sad and criminal this raid into Syria is, I am amazed to see that some people (especially Syrian officials) were actually surprised it happened. What were you thinking, no October surprise? Of course Carter is popular today, he’s become partisan on the issue which, since he’s an ex-President, is very easy to do. Carter could never get elected with such partisan views, so again, I’m not quite sure why you would wish for another President Carter – as opposed to citizen Carter. Also, that clip looks authentic to me. The two long burp sounds at the beginning and the one at the end are definitely a GAU-2 minigun, undoubtedly fired from one of the helicopters. The sound is quite distinctive. 1. “Bad intel” or something similar provided the wrong target and the wrong people were killed/captured. 2. The intel was good, and the people the US military was after were captured/killed. 3. The intel was good, and the people the US military was after were captured/killed but innocents were also killed. Right now, I think the most likely scenario is #3. October surprise? I don’t see how this helps McCain at all, especially consider Obama is the one who has actually said it’s OK to violate sovereignty if the host country can’t/won’t take care of the issue. Is McCain still relevant, you think? Why did they close the American school? That’s not punishing the Bush administration, that’s punishing the good Americans and non-Americans that reside, work in, and love Syria. I understand some of the reasons I guess, but maybe the opposite should have happened – put tons of security around the school, and post signs saying “We deplore the U.S. administration that ordered this attack, but we still accept the American people.” No? If I were a “Syrian official,” I too would have been surprised. Very surprised. After all, this trafficking has gone on for several years with nothing but diplomatic urging, the volume is down, the government’s statement that it is helpless to stop it seems to be accepted, the policy announcement at the United Nations would have been taken as explaining the action in the Northwest territories of Pakistan, and nobody asked ‘what about here?’ Nobody. So it happens. I give the government officials and others a break. I think I would have been unaware also. By the way. It was not criminal. 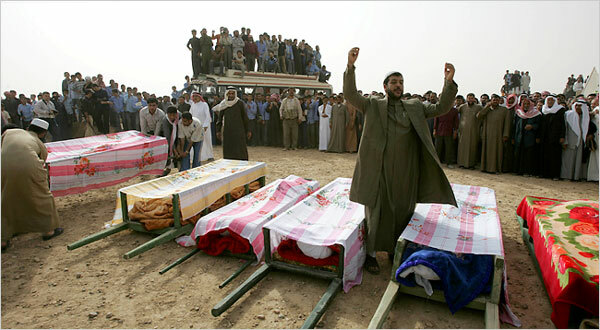 The person taken out was the leader in the network that sent youths to Iraq to kill civilian men, women and children. His customers have been very successful. He is not even Syrian; he is Iraqi. It is not criminal to take out those who are committing murder in your country. Or is it? New York (dpa) – Syria asked the United Nations Security Council on Tuesday to take action to prevent further attacks by the United States on its territory. Jaafari told reporters, after making the request. Jaafari said he sent letters to UN Secretary General Ban Ki-moon as well as Chinese Ambassador Zhang Yesui, the current president of the 15-nation council, asking for action to be taken. He did not provide further details. The US military airstrike on a remote border area village in Syria is believed to have killed a top al-Qaeda operative. Insurgents fighting US troops in Iraq had been using the Syrian border to enter Iraq. Syria’s state-run media said eight civilians, including four children, were killed in the raid. Gee, I remember when Nixon sent troops into Cambodia, justifying the incursion as “hot pursuit”. His successors have forgotten all about hot pursuit, replacing it with “just do it”. The hypocritical US should be ashamed of playing the “terrorism card” as an excuse for mayhem (just thinking of bloody acolytes of the USA, such a Jonas Savimbi who ran amok for years with the blessing of Washington). Which reminds me, such characters were the darlings of Cheney and Elliot Abrams. Of course Syria should go the Security Council with this violation. But … it will be nice to see President Obama, surrounded by cheering Syrian people, open the school again few months from now. Syria has every right to take its grievance to the United Nations and have this issue ironed out there. For us who are not at the United Nations, we can can discuss why would a country go to such effort to protest the killing of a non citizen who was engaged in exporting murderers (terrorists) to its neighboring country with whom it professes friendship? It seems that you have secure and reliable information that the person killed (one of the 8 killed) was a known terror master. The rest of us either don’t have such a secure access or simply choose to dismiss any information by the Bush Misadminstration as a blatant lie. I belong to the latter category. And, any observer of recent events in Syria should have noticed that some Superpower assets are hard at work from the inside and the outside. C’mon now, does it really take a rocket scientist to figure it out? I appreciate your expertise in the matter. This is very fascinating to understand in your way too. I also distrust both sources of information. 1. On a phone conversation I had with someone in Bou Kamal that same evening who saw the planes fly in, heard the shots and was in the city hospital when the bodies were brought in by relatives and people from the village. 2. I have followed fairly closely the war in both Afghanistan and Iraq and particularly the Guantanamo situation. There were many many mythical figures that were hypothesized ( you would call it bad intel.) and Abu so and so…who were claimed captured, dead, responsible for this and that who never materialized. It is a continuously woven fiction that needs to be unwoven the next few days, for lack of factual evidence. If we are to believe a version of events then we do need something more than an espionage thriller story. Give me any day the old barbaric version of showing one dead body, one captured human being, one scalp….for the infinite numbers of words that have been dispensed. But then again, we would all think it was manufactured evidence any way – sad. Shai, you meant every Republican’s McPain? Many analysts here are wondering about the future about the hijacked Republican Party after being run to the ground by shameless ideologues – let alone the future of the Hockey Mom from Neiman Marcus. Abraham Lincoln must be turning in his grave witnessing what had happened to the party that once stood for liberty and justice. And voting we will and the right person for teh job will be finally elected. If the Syrian had attacked the US invaders and killed any of the Special Forces, then the White House would have used that as an excuse for further heavier attacks on Syria and that would be the October Surprise – as it is, the Syrians did nothing either because they couldn’t respond fast enough or because Assad decided not to do anything so no October Surprise. Is this a humiliation for Assad/Syria? I would suggest not as it was a criminal act that any country would have difficulty responding to – just imagine the Zetas launched a raid across the border from Mexico to kill an informer in the US, they could be in and out before the US could respond. Will Assad ever respond? We will probably never know – there might be a truck bomb in Iraq that kills a fair number of GIs – who is to say it was the Syrians. Look at your reasoning for a moment, if you would. The mere utterance of the key words “Qaida” “terrorism” “imminent attack” are enough to justify anything. It does not matter that there is not evidence whatsoever to the US claim. The mere mentioning of these magic words justifies anything and everything. Also, the mere showing up of US marines in a place is good enough justification in your mind for them to terminate anyone around who THEY suspect might be a threat to their “safety”. I.e. I decide to crash into your home for reasons I insists on keeping to myself, and if I don’t like the way you look at me during, I have every right to put a bullet in your head. After that I’m paraded as a national hero on Fox news! This is what your country is doing, and this is how it is viewed by much of the rest of the world, if you cared to ask. This setup can be used to sell anything. And sooner than you think, it can be used to sell anything domestically in the US as well, if need be. The recipient side of the godly wrath must accept their fate and shut up, or else they’re labeled as terrorist sympathizers. Gods do not have to provide evidence, or apologize about taking human lives. It is enough to say the magic words and the population (you) will excuse and swallow whatever is done in their name. Correct. Jimmy Carter was not popular AT ALL throughout the Arab world. I suppose the reason is two-fold. First, he brokered the first peace treaty between the Zionist Entity and Eygpt. And secondly, he dared to rescue our embassy personnel held hostage by the nacent Iranian theocracy using MILITARY MIGHT. All that is forgotten now that Jimmy Carter is a bonafide Israel hater. Anger at Camp David was not directed at President Carter. He is not an Arab like Sadat who was considered a traitor… because he made it very difficult for the rest of the Arabs to settle with Israel based on land-for-peace like Egypt did. Israel was only interested in taking Egypt out of the equation. Is Shai an Israel hater? They are all released now. Sorry that most of you will not be able to read them now that they are in old posts. Actually all of them had links, many links and they were highly formatted… looking like typical spam. If you want to escape the filter, less links and less formatting. Iraq is not US territory and the US forces ARE the foreign fighters in Iraq. The man they allegedly targeted is an Iraqi and not a foreign fighter. Video: SMH Chief Correspondent Paul McGeough explains why in his view America has lost its moral authority. See the debate live on smh.com.au at 6.45pm on October 29th. THE United States lost its moral compass in the rubble of the collapsing World Trade Centre, argues the Herald’s Chief Correspondent, Paul McGeough. “In the aftermath of the attacks on New York and Washington on September 11, 2001, America said it was going to war for its ideals but the way Bush went about it was a gross affront to the very ideals he claimed to be defending,” writes McGeough in today’s Opinion pages. Tonight McGeough will argue that “America has lost its moral authority” in the Herald’s final IQ2 debate for the year at the City Recital Hall. He will be joined in arguing for the proposition by former NSW premier Bob Carr, and Owen Harries, a visiting fellow at the Lowy Institute for International Policy, a former head of policy planning in the Australian Department of Foreign Affairs and adviser to former Australian prime minister Malcolm Fraser. McGeough writes that while “the US State Department publishes a report in which, straight-faced, it assesses the nations of the world for abuses such as torture and cruel, inhuman or degrading treatment or punishments, denial of fair and public trials … Washington is unashamedly contemptuous of the Geneva Conventions, the Convention Against Torture, the International Covenant on Civil and Political Rights and the Foreign Intelligence Surveillance Act”. Arguing against the proposition will be investment banker Mark Carnegie, Professor Geoff Garrett, head of the US Studies Centre at the University of Sydney, and Martine Letts, the deputy director of the Lowy Institute for International Policy and former secretary-general of the Australian Red Cross. Judging by Mr Carnegie’s opinion piece in yesterday’s Herald, they will have a tough case to argue – especially if you assume the US had moral authority in the first place. Whatever the case, hopefully the truth will come out. Regardless, even if everyone killed was a smuggler/terrorist, and the operating a tactical success, it was dumb and a strategic failure on so many other levels. Let Syria get protection from Iran! My suggestion to Syria is to invite the Iranian Revolutionary Guards to help controlling the border with “friendly arab” Iraq. Syria has all the rights in the world to call for protection from the threat of a heavily equipped ennemy who disregard international laws in order to execute its plans. I think this is what this operation is calling for. The only effect that attack will have is a stronger rapprochement with Iran. The silence of Saudi arabia and other US allies is deafening. The Bush administration should say goodbye to their Sofa! Recently I received information, which I regard as reliable, that the site in eastern Syria that has been a staging area for several years for foreign operatives was staffed by Syrian military officials and al Qaida in Mesopotamia in Iraq activists. It is understandable now why Syria has denounced the raid as “an outrageous crime” (how many government related participants here have made that statement? ), “an unprovoked attack on a sovereign country” a “criminal attack” “by a departing Bush administration,” and made a great show of coffins and onlookers. I think one has protested too much. Do not expect much comfort from Obama as long as such activities are ongoing. I think I omitted the word “all” between we and have and territory to territories. The we was inclusive to all nations at the General Assembly. Please define for us what signals or statements or actions you (or AIPAC, Likud, Neocon clubs) look for before someone, like President Carter, is branded an “Israel hater”. The signals, statements, and action that I would [I won’t speak for AIPAC, Likud, Meretz, Kadima, Neocon clubs (? ), Syrian Baath Party] use to determine if someone could be branded an “Israel Hater” is if that person wrote a book blamed Israel solely for the Arab-Israeli conflict and erroneously accusing Israel of implementing “apartheid” when Arabs have the SAME rights as citizens as Jews. Also Carter skips over the Arab and Palestinian resorting to terrorism for political purposes, the anti-Jewish media, and their support for terrorism. Lastly, if 14 of his close, liberal advisors quit because of this distortion of truth, I think that pretty much takes the cake. We’ll have to ask Shai. Please take a look at the latest post on my blog, about the raid. The Washington Post in an editorial below says it well. The Syrians have decided to help Al-Qaida and will pay a price for supporting terrorism. Now let us hear from the regime supporters here how the Washington Post is also unreliable. By the way, closing a school is the worst possible reaction and just shows how much the regime values education. After sponsoring terrorism against three of its neighbors, Syria plays the victim when its own border is breached. IT WAS interesting to observe the wails of outrage from Syrian officials yesterday following a raid on a target near the country’s border with Iraq, carried out by helicopter-borne U.S. commandos. “Criminal and terrorist aggression,” charged Foreign Minister Walid al-Moualem. “The law of the jungle,” bemoaned spokesman Jihad Makdissi at the Syrian Embassy in London. This from a regime whose most notable activities of the past few years have been the serial assassination of senior Lebanese politicians, including former prime minister Rafik Hariri; the continuous and illegal supplying of weapons to the Hezbollah militia for use against Israel and Lebanon’s democratic government; the harboring in Damascus of senior leaders of Hamas and other Palestinian terrorist groups; and — most relevant — the sheltering of an al-Qaeda network that dispatches 90 percent of the foreign fighters who wage war against U.S. troops and the Iraqi government. The logic of Syrian dictator Bashar al-Assad seems to be that his regime can sponsor murders, arms trafficking, infiltrations and suicide bombings in neighboring countries while expecting to be shielded from any retaliation in kind by the diplomatic scruples of democracies. For most of this decade that has been lamentably true: U.S. commanders and Iraqi officials have over and over again pointed to the infiltration of al-Qaeda militants through the Damascus airport and the land border with Iraq, and Syria’s refusal to curtail it, without taking direct action. Yet in the past year Israel has intervened in Syria several times to defend its vital interests, including bombing a secret nuclear reactor. If Sunday’s raid, which targeted a senior al-Qaeda operative, serves only to put Mr. Assad on notice that the United States, too, is no longer prepared to respect the sovereignty of a criminal regime, it will have been worthwhile. Mr. Assad’s government has lately taken a few cautious steps toward breaking out of its isolation, participating in indirect peace talks with Israel and granting formal diplomatic recognition to Lebanon for the first time. European governments have been quick with rewards, and the next U.S. president — if it is Barack Obama — may also hasten to upgrade contacts. If the Syrian regime is genuinely interested in making peace with Israel, distancing itself from Iran and the terrorist movements it sponsors, and rebuilding ties with the West, that is to be welcomed. What Damascus should not be allowed to do is reap the diplomatic and economic rewards of a rapprochement while continuing to plant car bombs, transport illegal weapons and harbor terrorists. Israel has let Mr. Assad know that it is prepared to respond to his terrorism with strikes against legitimate military targets. Now that the United States has sent the same message, maybe the dictator at last will rethink his strategy. Did it come to your mind that it is a crime for these people that told you that the place is a staging point for Al Qaeda and new about it not to do anything about that for years, while our soldiers are being killed in Iraq , Don’t you think that there is something fishy about that. so the bottom line you so called reliable sources are accessory to murder. Syria: Is it Jan. 20 yet? The ever-offensive Bush administration couldn’t leave without attacking somebody else: Syria. If a special operations raid was the White House idea of an October surprise, Sen. John McCain’s campaign can be excused for forgetting to send a thank-you note. Just last month, the administration appeared to be edging toward serious talks with Syria, which has played enormously positive roles in accepting Iraqi refugees, sharing intelligence after the 2001 terrorist attacks and, recently, tightening security along its Iraq border. But, then, the diplomatic signals switched from pursuing the kind of talks that President Bush’s own Iraq study group advocated in 2006. And, suddenly, the administration violates Syria’s sovereignty with an act of aggression. Once again, the American people are reminded of the need to rid themselves of an administration that repeatedly has chosen force, usually employed for dubious or flatly misstated reasons, over honest talk. This cannot help McCain, even though we think he, like Sen. Barack Obama, would encourage dialogue with Syria. According to The Wall Street Journal, Obama and McCain also generally share Gen. David Petraeus’ desire for talks with less radical elements of the Taliban. The White House is reported to be considering the idea. No need to wait for a new president. In the meantime, though, the White House has to be watched for signs of one more outburst of unjustified aggression: against Iran. Iraq rebukes US for commando raid as Syria appeals to UNMartin Chulov in Baghdad and Agencies in Damascus The Guardian, Wednesday October 29 2008 larger | smaller Article historyIraq’s government rebuked Washington yesterday for launching a military raid into neighbouring Syria from Iraqi soil, while Damascus retaliated by ordering a US school and cultural centre to be closed. In a brief public comment more than 24 hours after the special forces strike, an Iraqi government spokesman, Ali al-Dabbagh, said Baghdad rejected raids on its neighbours and did not want to be used as a launch pad. “The constitution does not allow Iraq to be used as a staging ground to attack neighbouring countries,” Dabbagh said, though he also called for an end to insurgent activity in Syria. The Syrian foreign minister, Walid al-Moualem, last night said Iraqi officials had “started to see the truth” about the raid. Damascus took its first reprisals against Sunday’s raid by ordering the indefinite closure of the American school and a cultural centre. Both cater to the small US community and other expatriates in the Syrian capital. The Syrian cabinet said the US had violated the UN charter and international law with its raid. Syria’s ambassador to the UN called for action to prevent a repeat attack. In a letter to the secretary general, Ban Ki-moon, Bashar Ja’afari said that the council holds the US “politically” and “legally” responsible. According to Syria, US troops, backed by helicopters, launched the attack near Abu Kamal, five miles into its territory, killing eight people including four children. US officials in Baghdad have refused to comment on the attack. However, officials in Washington and in the Iraqi government have claimed a henchman of the slain former leader of al-Qaida in Iraq, Abu Musab al-Zarqawi, was killed in the raid on a compound in Sukkariyeh. The man was identified as Abu Ghadiyah. Iraqi media also claimed that at least one man was captured and flown into Iraq by US forces, who disembarked from two of four helicopters. At least eight people are thought to have been killed. The Associated Press quoted a senior US official as saying Abu Ghadiyah was the leader of the most prolific network that moves foreign fighters linked to al-Qaida into Iraq, and was planning an attack within Iraq. “The tripwire was knowing an attack was imminent, and also being able to pinpoint his location,” the official told Associated Press. Officials in Baghdad say the Syrian town targeted during the raid was a major supply line to the northern Iraqi city of Mosul, from where intelligence suggests insurgents are staging what amounts to a last stand in Iraq. Mosul is also seen as a supply line north to Afghanistan, which many in Iraq believe is fast emerging as a new frontline for foreign Arab fighters committed to the global jihad ideology. The Iraqi army now has partial control of Anbar province, which stretches west from Baghdad towards the Syrian border. The province was dubbed the triangle of death in the early days of the US-led occupation and remained a hotbed of militant activity and attacks against coalition forces through four years of often blazing insurgency. لم تكن القيادة العسكرية الاميركية مهتمة بمن سيكون في مرمى نيران غاراتها داخل الأراضي السورية. واذا كان التبرير شبه الرسمي الاميركي للغارة التي تخرق علناً للمرة الأولى منذ غزو العراق السيادة السورية، بأنها تستهدف «مهرباً» مهماً للمقاتلين الاجانب الى العراق حيث ينفذون عمليات ارهابية، فإن ذلك يعني ان القيادة الاميركية تعتبر ان هؤلاء المقاتلين ازدادوا قوة ونشاطا بما قد يطيح ما تعتبره هذه القيادة انجازات في العراق، وان هذا التهديد بلغ حداً يستدعي المغامرة بغارة داخل الأراضي السورية على هذا النحو. وهذا ما يتناقض مع كل ما أعلنته واشنطن عن نجاح استراتيجيتها الجديدة في العراق، ومع تسليم مزيد من المناطق الى القوات العراقية، ومع ما يلاحظ من تراجع في حدة العمليات الانتحارية. ويتناقض خصوصاً مع الكلام الاميركي الاخير عن ملاحظة تراجع عبور المقاتلين عبر الحدود السورية، اي زيادة التعاون السوري، عموماً، في هذا المجال. من جانب آخر، تعطي هذه الغارة حجة اضافية للعراقيين المتشددين في مفاوضات الاتفاق الامني مع الولايات المتحدة. اذ، في ذروة المحادثات على البنود المختلف عليها ومنها تحديداً حق قيام القوات الاميركية بعمليات في دول الجوار انطلاقا من الاراضي العراقية، تتعزز المخاوف من ان يكون هذا البند حجة لمزيد من التدخل العسكري الاميركي وفق اجندة تخدم المصلحة الاميركية، وليس مصلحة الامن والسلم في العراق ودول المنطقة. وتاليا ستزيد الغارة من الضغط على الحكومة العراقية، خصوصا من ايران وسورية، اللتين تخشيان تحول هذا البند في الاتفاق الى تهديد مستمر لهما. وهذا ما سيزيد تعقيد هذه المفاوضات بدل تسهيلها، علما ان الادارة الاميركية تستعجل التوصل الى الاتفاق الامني مع العراق قبل نهاية السنة، وذلك من اجل ان يحصل التوقيع قبل نهاية ولاية ادارة الرئيس جورج بوش، ومن اجل ان تتفادى هذه الادارة العودة مجددا الى الامم المتحدة لتمديد الوضع القانوني الحالي لقوات الاحتلال، مع ما يمكن ان ينطوي عليه ذلك من مفاوضات صعبة، خصوصا بعد ازمة القوقاز والمواقف الروسية والصينية التي تبتعد اكثر فاكثر عن الموقف الاميركي مع نهاية عهد الادارة الحالية. الى ذلك، جاءت الغارة التي يعتبرها المحللون العسكريون استراتيجية جديدة في التعامل مع سورية، الى حد ان بعضهم شبهها بتلك المستخدمة في باكستان انطلاقا من افغانستان. لكن هذا التشبيه لا يستقيم ليس بفعل الاختلافات الكثيرة بين الوضعين الافغاني – الباكستاني والعراقي – السوري فحسب، وانما ايضا لأن مثل هذه الاستراتيجية المطبقة منذ فترة طويلة في باكستان ولم تظهر جدوى عملية في محاربة «طالبان» داخل افغانستان، تأتي في نهاية ادارة بوش، وعشية احتمال تغيرات كبيرة في القيادة الاميركية تفرض، بحسب البرامج المعلنة للمرشحين الى الرئاسة وتطلعات غالبية الرأي العام الاميركي، إعادة تقويم للوضع في العراق وفي التعامل مع الجوار. Yes, the Washington post is mostly neocon the past few years. Christian Scince Monitor, TIME, Newsweek, NY Times are ok most of the time. Syria’s hapless enemies … the Saudis, the Likudniks and the Neocons are hilarious. For the past five years they have been busy every day telling us how weak Syria is. If Syria is really that weak, why are they that preoccupied with Syria? Why not try writing about Somalia .. Djibouti … Yemen … There are many other weak countries to write editorials about if this is what they fancy. Ok, the Washington Post is a neocon paper. Have it your way. The editorial says nothing about whether Syria is strong or weak. It comments about the fact that Syria is a terrorist supporting country that is acting hypocritcally. And the reason this editorial is coming out now is because of the hysterical and hypocrtical Syrian reaction to the US raid. The Syrian military is working hand in hand with Al-Qaida to facilitate attacks against civillians and American soldiers in Iraq, but the Syrians complain about the attack. Their chutzpah has no limits and that is what the Washington Post was pointing out. My opinion is that Syria is very strong. It was able to close a school in retaliation. That is proof that Syria is a regional super-power. Next time someone here dares to describe Bashar and his wife as enlightened, I will remind them how they “retaliated” against the US by kicking children out of school. Enlightened indeed. As I said all along, actions speak louder than words. And Syria’s actions speak very loud. DO NOT USE MY NAME IN VAIN! If Syria wasn’t a regional player, why you ‘AIG’ spend your time writing and analyzing every little detail coming out of there, shouldn’t you concentrate more on important players instead of wasting your time writing on here. Spare us of your to come precious comments. “Today, in Syria, we have 1.5 million Iraqis, over 500,000 Palestinian refugees and in the six weeks of the summer of 2006 some 700,000 Lebanese have crossed the border finding refuge in Syria. It would be as if 5.8 million refugees arrived in Italy in a few months. What have we done? We have opened our schools… ensured free health care… and especially we have opened our hearts, our eyes and our ears”. This is one of the more significant excerpts of an interview with Asma al-Asad, wife of Syria’s president Bashir al-Asad, which was published by the weekly journal “Famiglia Cristiana” today. Mrs. Al-Asad, stressed that immigration is an issue that does not only affect the North of the world; she noted that in Syria, schools and been built and new classrooms established to meet the needs of 30,000 Iraqi children, who will become 50,000 next year: “We do it – she said – because if we give minors the chance to study, we support a generation, and it does not matter that they are Iraqis; they are our neighbors”. Commenting recent events, which have shown, in Italy as well, worrying signs of intolerance that often compromise peaceful coexistence, Mrs. al-Asad noted that in Syria Christians and Muslims have lived together for centuries in mutual respect: “it is something we have to protect and at the same time make it a banner around which to contrast those who look to religion as a factor for division… we need to remind that all faiths share the same values: love and compassion, respect and integrity, openness and acceptance of the other. If we return to these values, regardless of the fact that we are either Christian, Muslim or Jewish, we would discover that religion unites us”. For this reason, said Asma al-Asad, we need to pay attention and oppose the drive towards division that is coming from many sides: “When I hear talk of a clash of civilizations – said the Syrian first lady – I begin to think that this is a concept coined by people with a very closed mentality. There is but one civilization, the human one, and it does not matter where you live, where you have come from. And what faith you have”. From what I know about you through your 10,000 comments on this blog, I understand you are a very sensitive man (or woman). The closing of the school probably made you cry. You can keep implementing every AIPAC and camera.org propaganda trick you learned, … keep typing the word “terrorist” every other sentence … you have been doing that for over a year now. In the mean time, Syria will continue to be there to make sure your friends will fail to redraw (mess up) the Middle East to their liking. In few months … they will go back to Texas. President Assad will stay in Damascus to wish them good luck… like he wished Jacques Chirac good luck in his retirement (and corruption trial) … and like he will be there long after the leaders of the “Arab moderate” states are gone. And … Former secretary of State George Shultz? … He has been recommending to each American administration since the 80’s to boycott and punish the Syrians. Donald Rumsfeld? … alwas Syria’s enemy .. from the days when he used to shake hands with Syria’s enemy, Saddam Hussein, until he resigned as the worst-ever secretary of defense. Oh … Syria is so weak. Your loud friends are strong. you might be joking but this actually might happen in reality. You’ve heard of the drive through voting machines? I kid you not, they’re going to try them in cali. Mr. Enlightened, excellent article from the SMH, I enjoyed it thoroughly. Thank you for linking. The debate is on tonight, they are a very good series of debates. You can access it tomorrow or later on tonight sydney time. I have no luxury the wifey has me on standby for a delivery in the next 24 hours. I wonder where I can access the debate? I am sure it will be on youtube sometimes in the soon future, though. I hate writing long comments because i am a pretty lazy person and I have a feeling arguing with you is a futile exercise. But since no one has answered your query about the Washington post article directly i am gonna try. WP article reflects many Western nations opinion that Syria is harboring fighter that are conducting terrorist activities in Iraq. But what they fail to remind us with is that the US has refused to open the proper diplomatic communication channels with Syria. They have systematically hindered any steps Syria has taken to build relationships with Europe or start peace negotiations with Israel. More importantly American media forgets the fact that the US army has ILLEGIALLY occupied a neighboring Arabic country. So please remember this the next time you are trying to argue about this subject: the Iraq war was WRONG and anyone who says otherwise is either a liar or a complete moron. So, I would like to know from YOU? How would you deal with a country that helps your arch enemy (Israel) continue to hold on to a part of your country illegally. Or a country that has caused mayhem on your doorstep and millions of refugees to clog up your already faulty social system? That has blocked you from obtaining modern weapons to conduct a “clean” fight and then has the audacity to claim your harboring terrorists while at the same time praising and supporting the source of Islamic terrorist philosophy. How do you think the US should react if another country forcefully invades Mexico in the name of freedom spreading and then some Mexican militants start using the American southern border to fight them off? You need to keep in mind that not all fighters should be considered terrorists. That said, I am sure Syria knows there are such shady characters on their soil. But it shouldn’t feel obliged to bend backwards for the US when there is a very simple way to get Syrian help on the issue. The US should simply reappoint their ambassador to Damascus and stop attempts of destabilizing it. Great news! Hope everything goes smoothly… My 3rd son just turned one year old this week, what a joy… Hopefully our children will live in a world more peaceful than ours. Could you please share my e-mail address with Shai or vice versa? However there is no risk that I’ll vote for McPalin, isn’t that obvious? There is also a small technicality: I’m not a US citizen. Rumyal, I am curious. Where are you from? Rumyal, I know… (about the McPalin issue). Rumyal, I am sure you did. I am sorry I wasn’t keeping up with the forum. I used to be here almost everyday. But in the last few weeks there was nothing overly interesting going on. So I must have missed your biographic details. Where are you from/at? I checked the map. If Shai is correct and Mecca is halfway between you and him, then you must be in Somalia. Shai, Mecca folks are a bit peculiar ’bout who should visit their turf and who shouldn’t. Let’s leave them alone to their misery. Why don’t you come over to Dubai and we can have coffee and argileh? I am assuming you have an american passport or a uk one? I am a Syrian national living in Dubai. I’ve just checked the map, what falls right in the middle of a straight line between me and Shai is an american military base in Hafer Al Batin in Saudi Arabia, now isn’t that symbolic? Stop pretending you live in Dubai. Rumyal, Offended is indeed from/at Somalia. Dubai sounds a hell of a lot nicer than Mecca, and I know quite a few people who’ve been there, and loved it. Yes, unfortunately, there haven’t been too many Jews allowed into Mecca in recent years, but I hope that too will change one day. Kind of funny how the Saudi king is talking about communication between the religions, yet Jews or Christians can’t even enter Mecca or Medina. Can you imagine a decree that said Muslims can’t enter the Vatican, or Rome?!? But no, I do not hold a foreign passport, believe it or not. I could have an American one, because my mother, my wife, children, and more than half my family are American, but for that I’d have to live in the U.S. for a while. Like I wrote trying to “prove” my patriotism to AIG (as if I owed him an explanation), I am choosing to remain in Israel now, and to contribute my two-cents worth. Maybe one day my frustration will reach such levels that I’ll take “a break” for a while, like Rumyal and many others have done. But in the meantime, I’m here. I enjoy smoking argileh with my Arab friends (sorry Alex, I know you want me to quit), so it’s a date. And if OTW joins us, I’ll bring some nice Cuban cigars as well. For the record, though, I do not smoke regularly, and never cigarettes. >>> now isn’t that symbolic? Read my new post … Your Dubai is in it. Offended, you’re right, halfway is probably the airbase. And I hate American “coffee”. So I’m coming you way. Alex, I knew you’d stay up all night to put this new piece on the air. Now go to sleep! We need you strong and healthy here. I would certainly love to visit the holy lands once before I die. (that was not an innuendo about a suicide bombing attempt by the way 🙂 ). Shai, one paragraph in that piece (the one offended will like) is the one you wrote to me last week. The other, boring, parts are all mine. THE WEEKEND attack inside Syria by US Special Operations Forces hunting for an alleged smuggler of Al Qaeda recruits into Iraq may have a fleeting tactical benefit, at best. In all other ways, it runs counter to the interests of the United States and its allies. Thanks, Enlightened, for the link to the Australian debate. Is anyone in the US listening? There has been all along supposedly much more that is known about this smuggler and I am going to try- when I get a moment- to look through documents posted on the National Counterterrorism site for open information that has been available on him there for months again allegedly- This all referred to in an AP IMPACT article on the matter last evening. In addition to what Norman asked : Why, if the whereabouts were so clear and specific would Syria not be involved in a joint counter-terrorism action on this man ? It is beyond comprehension that the Syrian regime would refuse to respond to such specific information, the man’s actions would be illegal according to Syrian law as well. Do you have any insight on the issue of “collateral damage” and how it is actually handled in practice in the U.S. military? Kenneth Anderson wrote a useful article, addressing the subject from the U.S. military legal standpoint, for the NY Times Magazine a few years back appropriately entitled “Who owns the rule of War ?” that I find useful to consult every once in a while. Yes, I’ve read a bit and it seems this individual has a history, including, reportedly, leading a raid earlier this year across the border that killed 11 Iraqi policemen. Also, historical news reports have indicated that Syria was asked to deal with this individual. Now, we don’t know what went on behind the scenes. I suspect that once the US thought it had good information on his whereabouts they weren’t inclined to share with a regime they likely considered uncooperative on this particular individual. But in the end, no one really knows. An apology would require the US to officially admit the raid took place – something that hasn’t yet occurred to my knowledge. On “collateral damage,” it depends on the context. Although Rules of Engagement (when and how US forces can use force) are classified, one precept is that US forces can use deadly force in the face of a hostile action or hostile intent. I suspect that anyone with a weapon would have been killed in an operation like this. There is also the issue of proximity of non-combatants to combatants. The most frequent cases where non-combatants are killed are when combatants are in close proximity to them. A simplistic example is that combatants are firing at US soldiers from a house. In response, the soldiers fire back, shoot a missile at the house, or whatever. In the aftermath, the soldiers learn there were non-combatants in the house by their returning fire. Something similar may have happened in this case since it sounds like this individual and his compatriots were in a village. If this guy and his compatriots were near non-combatants it obviously increases the chances of those non-combatants getting killed by one side or the other. I’m not sure if that answers your query or not. Thanks-I would like to know a lot more on the matter of course, but I always forget that famous word “classified”…. It seems that since WWII the status of civilian populations in war zones has declined a lot in the “civilized” societies. I cannot find trace of a report of an attack on an Iraqi police station and the death of 11 policemen near the Iraqi/Syrian border in May 2008 or before [surely it would have made the news at least for the day], and now al-Qaeda is claiming that this man Abu-Ghadyah died in 2004 near Falluja. Look at the news of the “nuclear material” in Syria surfacing now…I am very worried that all this may be the beginning of an escalation by the U.S. aimed at Syria since Iran is too formidable an enemy to mess with before Cheney & Co fold their tent. I was thiking the same thing.In addition to what Norman asked : Why, if the whereabouts were so clear and specific would Syria not be involved in a joint counter-terrorism action on this man ? It is beyond comprehension that the Syrian regime would refuse to respond to such specific information, the man’s actions would be illegal according to Syrian law as well.